Reading and share top 4 famous quotes and sayings about Memories And Friendship by famous authors and people. 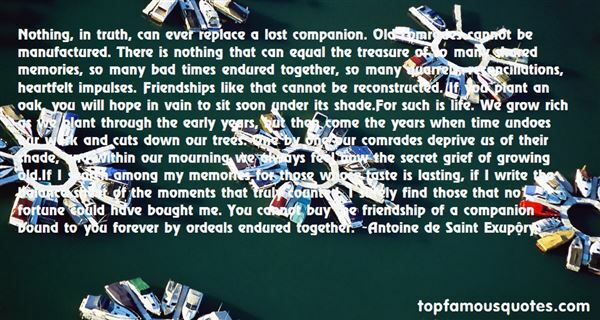 Browse top 4 famous quotes and sayings about Memories And Friendship by most favorite authors. 1. "Nothing, in truth, can ever replace a lost companion. Old comrades cannot be manufactured. There is nothing that can equal the treasure of so many shared memories, so many bad times endured together, so many quarrels, reconciliations, heartfelt impulses. Friendships like that cannot be reconstructed. If you plant an oak, you will hope in vain to sit soon under its shade.For such is life. We grow rich as we plant through the early years, but then come the years when time undoes our work and cuts down our trees. One by one our comrades deprive us of their shade, and within our mourning we always feel now the secret grief of growing old.If I search among my memories for those whose taste is lasting, if I write the balance sheet of the moments that truly counted, I surely find those that no fortune could have bought me. You cannot buy the friendship of a companion bound to you forever by ordeals endured together." 2. "I haven't been a good guest in Hugo's life. I access his memories and discover that he and Austin first became boyfriends at this very celebration, a year ago this weekend. They'd been friends for a little while, but they'd never talked about how they felt. They were each afraid of ruining the friendship, and instead of making it better, their caution made everything awkward. So finally, as a pair of twentysomething men passed by holding hands, Austin said, "Hey, that could be us in ten years. "And Hugo said, "Or ten months. "And Austin said, "Or ten days. "And Hugo said, "Or ten minutes. "And Austin said, "Or ten seconds. 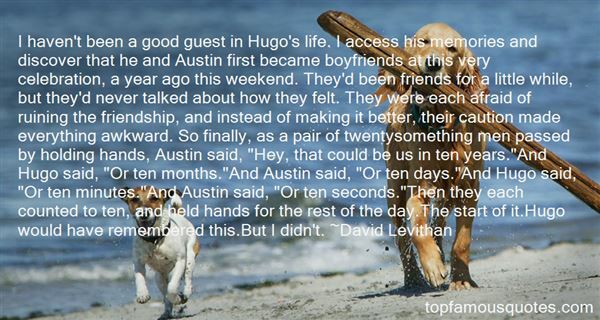 "Then they each counted to ten, and held hands for the rest of the day.The start of it.Hugo would have remembered this.But I didn't." 3. "In these pages, and in my memories, she reminds me that a short life can also be a good and rich life, that it is possible to live with depression without being consumed by it, and that meaning in life is found together, in family and friendship that transcends and survives all manner of suffering. As the poet wrote in the Bible's Song of Solomon, 'Love is strong as death.' Or perhaps even stronger." 4. "Life is subjective as far as memories are concerned. 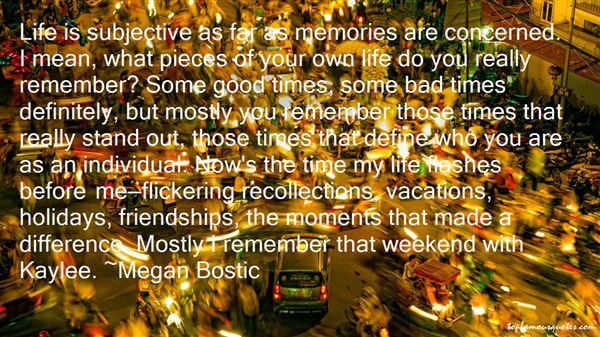 I mean, what pieces of your own life do you really remember? Some good times, some bad times definitely, but mostly you remember those times that really stand out, those times that define who you are as an individual. Now's the time my life flashes before me—flickering recollections, vacations, holidays, friendships, the moments that made a difference. Mostly I remember that weekend with Kaylee." There's a place for doctrine and dogma, and science and history and apologetics, but, these things are not Jesus - they are humanly manufactured attempts to make people think that having the right ideas is the same thing as loving and following Jesus."